I will be needing to put some reasonably tight bends in 10mm/3/8in od copper pipe. Before obtaining a purpose built pipe bender I was proposing to anneal the pipe where required then fill with cast in lead in the hope that this would support the pipe walls sufficiently during bending. Has anybody had experience of using this as a process? An option would be to find a long coil spring with a 3/8" bore and slip it over the copper tube where you intend the bend to be. 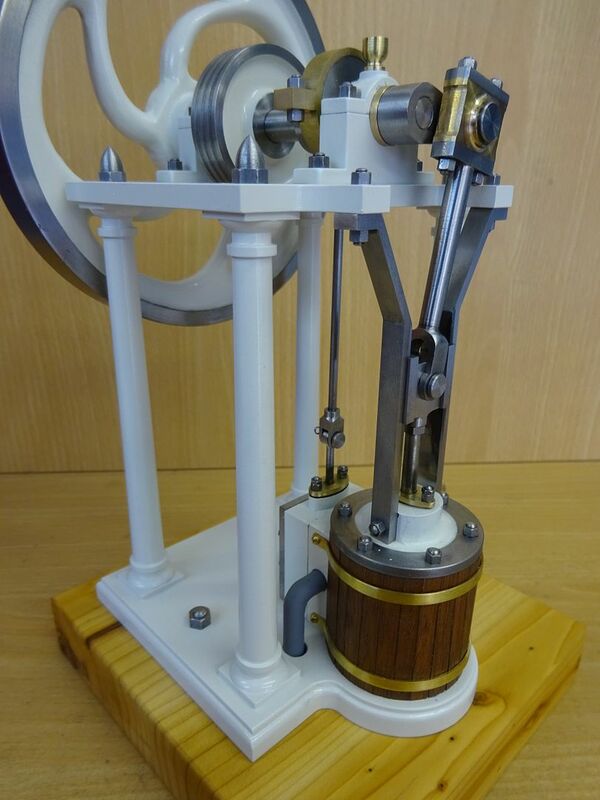 The spring will support the surrounding area to equalize the pressure around the bend and minimise the chance of a sharp kink. I have a set of commercially made ones are made for this purpose, but are not immediately available to post photos. I have done it with pipe filled with dry sand, not lead and also the coil spring method. (springs are available at hardware and plumbing suppliers, internal and external types). What radius bend are you trying to achieve ? You need a product called Cerrobend, it becomes liquid in boiling water and does not adhere to the inside of the tube, looks like lead when it sets. Just reheat the pipe to run it out after bending. Where can I buy Cerrobend ? It is listed on ebay in USA, 1/4lb stick costs $16 but $66 for postage. One of our plumbers at work has a small set of pipe benders for 6,8 and 10mm pipe mainly for central heating work I think. Quite small hand held benders. Thanks, not done any final measurements as the project (Centaur) is still under construction but I am guessing at a radius of somewhere between an inch and an in and a half. I have used bending springs on larger pipes (internal) to good effect but it seemed rather extravagant to purchase a spring for probably only a couple of bends! As it would purchasing Cerrobend. I have some scrap lead so I might have a play. I had considered ready made fittings, I even bought a couple today! My application involves silver soldering pipe or fitting into a flange which will be bolted to a water jacket by 2 2ba fixings the spacing of the studs doesn't allow for the pipe to go into a fitting and fit between the fixings - it's very tight! So the pipe must go directly into the flange and off to the cooling tank, the inch rad is just a guesstimate and could quite possibly be a good deal larger. I will experiment tomorrow and report back! I had a similar requirement with 1/2" pipe and a 1" radius bend a few years back for the blast pipe on my traction engine. Bend needed to be tight to get the blast nozzle in the centre of the chimney! The pipe was thin walled AC copper pipe also which made it worse. Did a bit of research and salt was recommended rather than sand as it is finer and packs tighter. In order to get the salt to pack down tight it was recommended to hold an engraver or similar against the pipe to induce vibration to pack it down (didn't try that as I didn't have one!). Was told there was no way I would get a bend that tight! Red rag........ I annealed the pipe and packed it with salt, crimping the ends. Got a lump of hardwood and filed a profile of half the diameter of the pipe into it and the radius required. Then clamped the pipe to it with a horseshoe type bracket and used the back former from a commercial bender (straight lump of ally with a u groove milled in it, half the diameter of the pipe) and worked it round by hand. On completion it was a pretty fair bend, the pipe had gone a little oval but removing the salt, another anneal and some careful dressing with a planishing hammer sorted it. Polished up quite nicely. Subsequently I was advised to put a cork in one end of the pipe, fill with water and put in the freezer (after annealing) instead of filling with salt or sand. Not had a need to try that yet but it sounds plausible and it's cheap and clean. Would allow a second anneal during the bend without having to un crimp the pipe to empty the filling medium and clean it out before annealing again. I have a similar job to do with 1" pipe this year for the latest engine so may give the ice method a shot. I find the best way to get tight bends is to chop up plumbing fittings to remove the socket and then silver solder them to the tube, you can add a small spigot piece inside if needed but as yours are just for cooling water probably not worth bothering. "Full Crossovers" are best but it can be done with end feed or solder ring elbows as you will have a job to find 10mm crossovers. For really tight then use a bull nose cutter to put a couple of holes into a block so that they meet, solder in your pipe and then shape the outside. 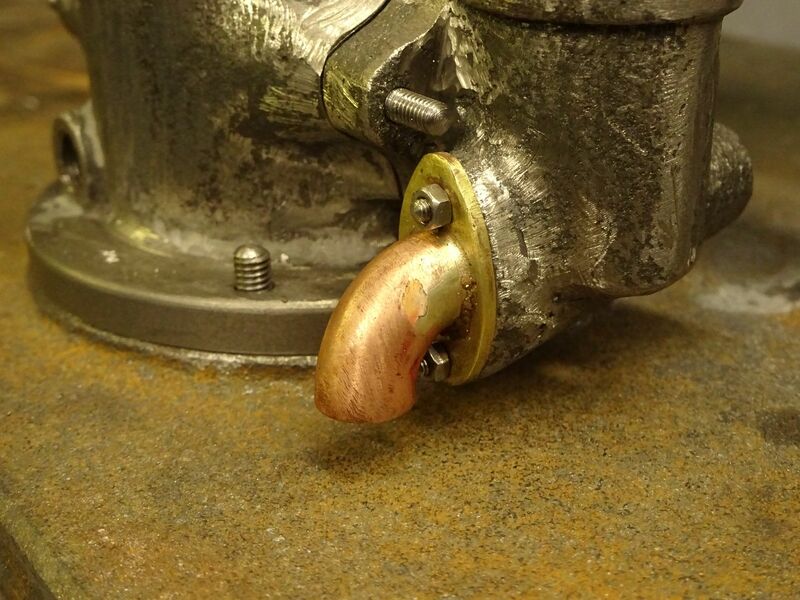 Finally 1/8" BSP would not look out of place and you can get some nice looking brass fittings that would mimic old malable iron fittings which were often used for plumbing up full size engines. You can use thinner wall material so you get bigger than 1/8" bore. If it is of interest, I re-plumbed the heating system in our current house 18 years ago in 10 mm microbore pipe. 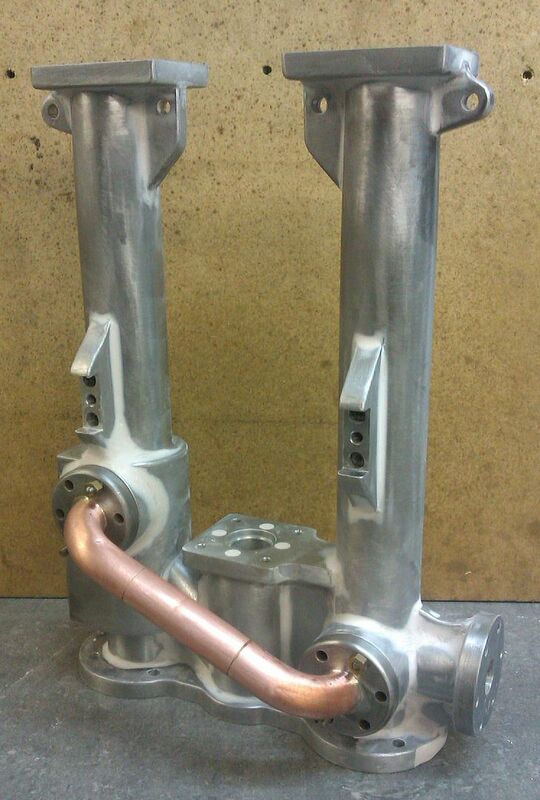 For the bends, I used one of the commercial hand held pipe benders directly on annealed 10 mm bore copper pipe, no fillers or springs were used. 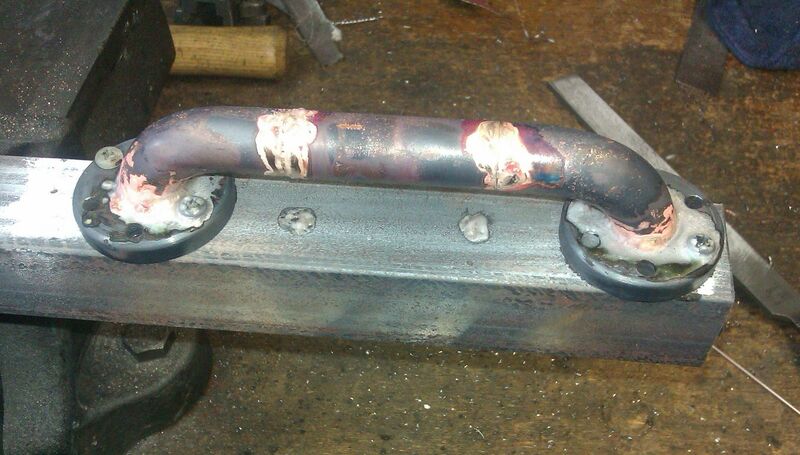 As a result I was able to get tight bends of 90 and 120 degrees without any further treatment such as annealing. Really tight bends are best done with fittings. The bender I bought was from the plumbing merchants and it will handle 6 and 8 mm bore pipe as well. A neat little gadget and easy to use. ... Subsequently I was advised to put a cork in one end of the pipe, fill with water and put in the freezer (after annealing) instead of filling with salt or sand. Not had a need to try that yet but it sounds plausible and it's cheap and clean. Would allow a second anneal during the bend without having to un crimp the pipe to empty the filling medium and clean it out before annealing again. I have a similar job to do with 1" pipe this year for the latest engine so may give the ice method a shot. The ice technique is used by some brass musical instrument makers. There is a very clear description here, starting at 2:40. One advantage of Cerrobend is that it expands slightly on freezing making a tighter packing. Lead shrinks. Water expands too, maybe too much. Had a play this morning. First mistake was heating the lead in a tin can - it had a laquered finish inside which burnt off with copious amounts of smoke! Eventually poured the lead into my annealed and pre heated 10mm tube. Allowed to cool I then pulled it round a piece of 2 inch diameter material, went round really well and putting a Vernier around the bend can find no more unevenness in the bend than in the rest of the pipe (about 30/40 thou) Melted out well afterwards. Unfortunately the above has made me realise I need much tighter bends so will probably assemble and silver solder using carved up commercial fittings (like Jason's) which seem to be able to give an unbelievably tight bend! Photo of the bend in my miscellaneous album. 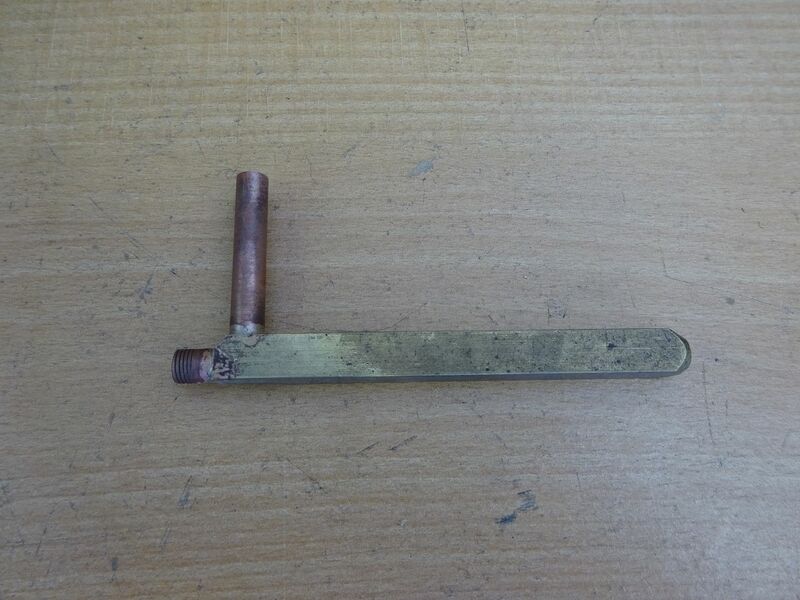 For stationary engine work I use thick walled copper pipe which when annealed forms easily around a round steel of brass bar ,the pipe is available from ME suppliers who stock cu pipe ,tube and plate for loco boilers.